Format of RRB NTPC Caste Certificate for OBC, ST/ ST Candidates - Download Annexure form for Railway Exam Caste Certificate: Looking for OBC Certificate format or Caste Certificate for SC/ ST? Since couple of days, a large number of reserved category candidates are asking for Caste certificate format (Annexure form )for RRB NTPC and more about RRB NTPC OBC Certificate format. Those candidates can download RRB NTPC Caste Certificate for OBC, SC/ ST candidates. As we all know that RRB NTPC final Result to be out and list of shortlisted candidates for appearing at Document verification for ASM, Guard. TA, CA and clerk posts will be published shortly. In the meanwhile candidates who are getting high marks have chances of getting call for Direct Verification directly as per the post preferred by them. 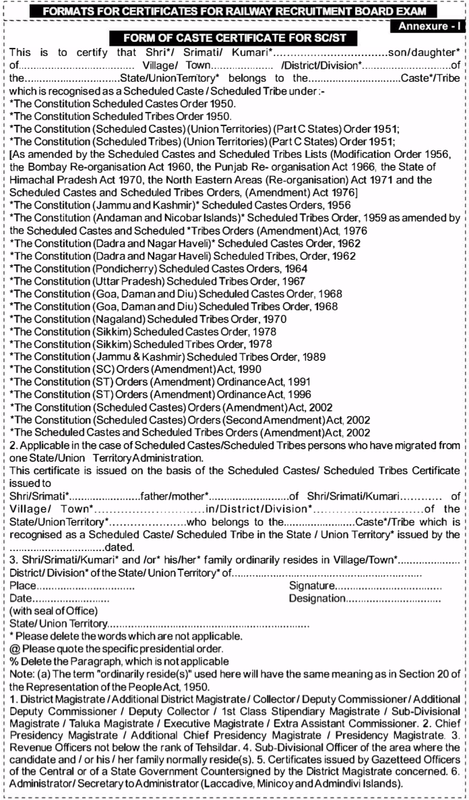 All OBC, SC/ ST candidates, to avail reservation, they need to bring Caste Certificate obtained from an Govt Offices. To solve this problem, here we have once again come up with RRB NTPC Annexure I, II, II-VI form which is format of various caste Certificate for OBC, SC/ ST, Income, Disability candidates. All those candidates who are called for Railway's RRB NTPC Document verification against a post notified under CEN 03/2015, they will need to bring Caste/ OBC/ Disability/ Income certificate, whichever is required. The Railway Recruitment Boards (RRBs) have made RRB NTPC Caste Certificate for OBC, SC/ ST candidates available in the form of Annexure I-VI. Railway's Format of Certificates are needed for RRB NTPC. RRB NTPC OBC Certificate format is given below. 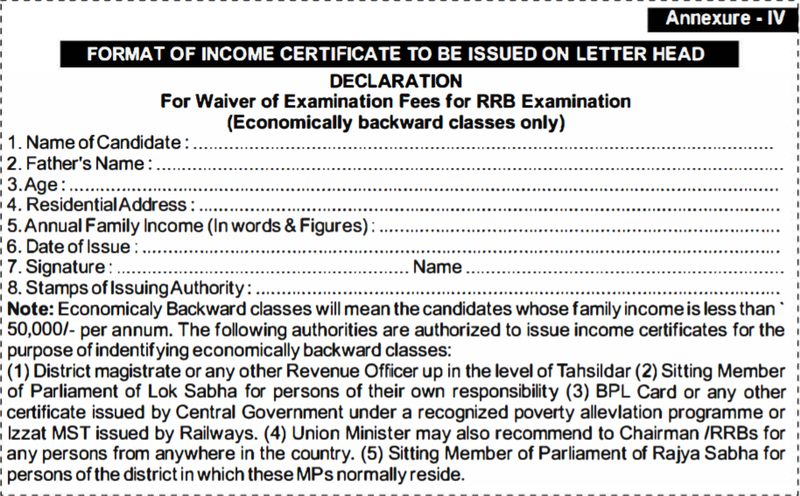 Form of Certificate to be produced by Other Backward Classes qualified for appointment through RRB NTPC to any of the post under the Government of India. Candidates declared as qualified are required to submit this OBC Certificate format at the time of Document verification. Format of Certificate for SC/ST Candidates are given below. All those SC/ ST candidates qualified for RRB NTPC Exam, are required to submit SC/ ST Caste Certificate at the time of Document verification. Format of Income Certificate for RRB NTPC exam are as follows. Candidates from EBC community who has been declared as qualified for RRB NTPC exam are required to submit income certificate at the time of Document Verification. # To avail Reservation benefit, above mentioned Certificates are need to be submitted at the time of Document Verification of all posts i.e. CA, TA, Clerks, ASM, Traffic Assistant, Goods Guard and Traffic Apprentice posts. 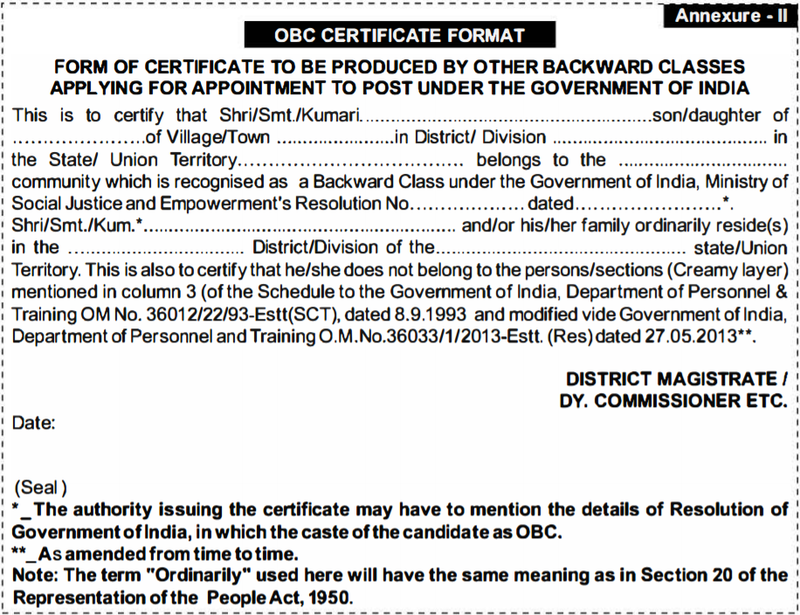 # OBC Certificate should not be older than one year from the date of closure of the Employment Notice. # Only EBC candidates can submit Income Certificate for Waiver of Examination fees. The RRB NTPC Caste Certificate format for OBC, SC/ ST candidates is same for each Railway Boards/ Zones. The above mentioned RRB NTPC Eye Vision Certificate format is for all Railway Recruitment Board (RRBs) including RRB Ahmedabad, RRB Ajmer, RRB Allahabad, RRB Banglore, RRB Bhopal, RRB Bhubaneswar, RRB Bilaspur, RRB Chandigarh, RRB Chennai, RRB Gorakhpur, RRB Guwahati, RRB J&K, RRB Kolkata, RRB Malda, RRB Mumbai, RRB Muzaffarpur, RRB Patna, RRB Ranchi, RRB Secunderabad, RRB Siliguri and RRB Thiruvananthapuram.